ARCHITECTURE LOVE - AUGUST 2018 – Analog Watch Co. This is the most visited monument in the world. August - October is the best time of year to visit Paris. Considering this information, I thought I'd share some fun facts about a 129 year old piece of architecture we all know and admire, The Eiffel Tower! I'm sure you recognized it's magnificence without a doubt. 1. It was built for the 1889 Exposition Universelle, a celebration of the 100th year anniversary of the French Revolution. 2. The tower is 324 meters tall, antennas including, and weighs 10,100 tonnes. 3. There are 1665 steps to get to the top! Or you can just take the lift, which travels approximately 103,000 km per year. 4. How much does it cost to take the lift to the top of the Eiffel Tower? €19. 5. In the cold and winter months, the tower shrinks about 6 inches. Neat! 6. Gustav Eiffel also designed interior components for another beloved monument, The Statue of Liberty. 7. The tower is repainted every 7 years and requires 60 tonnes of paint. 8. Are you familiar with object fetishes? 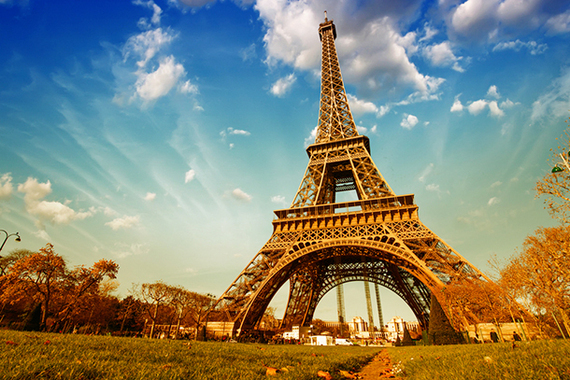 Well, in 2008 a woman married the Eiffel Tower and changed her name to match her new partner, Erika La Tour Eiffel. 9. The third floor, formerly used as a space for Gustave to entertain guests, it is now open to the public. I would have been thrilled to be invited to one of those parties! 10. 72 engineers, mathematicians and scientists contributed to its creation. Their names are engraved on the side of the magnificent structure.